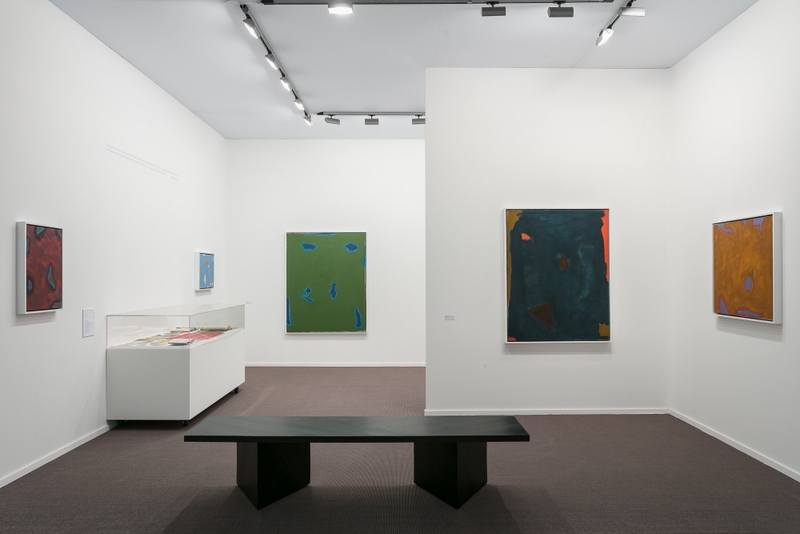 Alexander Gray Associates presents paintings by Betty Parsons (1900–82). Though widely recognized as an influential dealer through her eponymous gallery, Parsons was first and foremost an artist, having begun her career after moving to Paris in 1923 where she trained as a painter and sculptor under Antoine Bourdelle and Alexander Archipenko. Highlighting her adept and bold use of color, the presentation is a survey that brings together abstract paintings on canvas and paper dating from the 1950s to the late 1970s. The presentation is is the first time her work has been shown in the United Kingdom since a solo exhibition at the Nigel Greenwood Gallery in 1980. An early champion of Abstract Expressionism, Parsons found her own language of abstraction in the late 1940s, capturing what she termed “The New Spirit.” After years of depicting landscapes and portraits in figurative watercolors, she described her shift to abstract compositions as an effort to capture not what a place or event “looked like, but what it made [her] feel.” In the subsequent decades, she referenced sites that resonated with her without making literal illusions or illustrations. Instead, Parsons’ innate ability to locate the essence of a place or a moment was the driving force behind her work, evoking what she characterized as the “sheer energy” of a situation. Her sources of inspiration were varied, though often drawn from extensive travel in Africa, Europe, Mexico, Japan, and elsewhere but also from Native American art, the American west, Eastern spirituality, and found objects. Parsons’ paintings from the late 1950s onward demonstrate her passion for creative play through impulsive gestural brushstrokes and brightly colored shapes. She developed a consistent compositional form of floating “islands” in the early 1960s, in which she placed patches of color amid monochromatic fields of vibrant hues applied in thin layers allowing the surface of the canvas to remain visible. Paintings on view, including Night Forms (1960) and Clear Day (1965) are typical of Parsons’ particular brand of abstraction — never hard-edged, not exactly gestural or biomorphic, but always colorful; playful; bold; and expressive. As curator Lawrence Alloway described of her work, “she is cued by color wherever she find herself, by an evening sky, a flowering tree, a plumage, and these remain, within the format of abstract art, the basis of her work. Hers is an associative abstract art not sealed off from nature by a canon of concreteness, but infiltrated by roots, lit by the sun, and washed by the sea.” Parsons persistently evoked nature, not in terms of specific topography but as effects of light and color that permeate works such as Green Field (1966) and Evening Light (1974). Parsons creates these lyrical surfaces with thin layers of paint, pushing the paradigm of flatness in Abstract Expressionism even further than her contemporaries. Concurrent with Parsons’ developing career as a painter, she opened The Betty Parsons Gallery in 1946. Throughout her career as a dealer, Parsons strove to exhibit challenging art by undiscovered artists, regardless of sales potential or unconventional content, fostering the early careers of key figures in Abstract Expressionism, including women and artists of color. This appreciation and understanding of art stemmed from her own practice and training as an artist, and throughout her career, she balanced two seemingly disparate roles: that of a dealer and that of an artist. In Calvin Tomkins’ profile in The New Yorker in 1975, Parsons explained, “Painting is a compulsive thing with me. It’s a way of keeping alive. There’s no conflict between my work as an artist and my work as a dealer, because when I sit down to paint I have no recall. Nothing interests me except the direct contact I try to make with the canvas.” Parsons serves as a key example of a woman who shaped the canon through her persistent support of underrepresented artists, all while maintaining a rigorous studio practice, and while her nearly six decades of luminous paintings were exhibited and sold throughout her lifetime, they were timidly recognized by the art world.